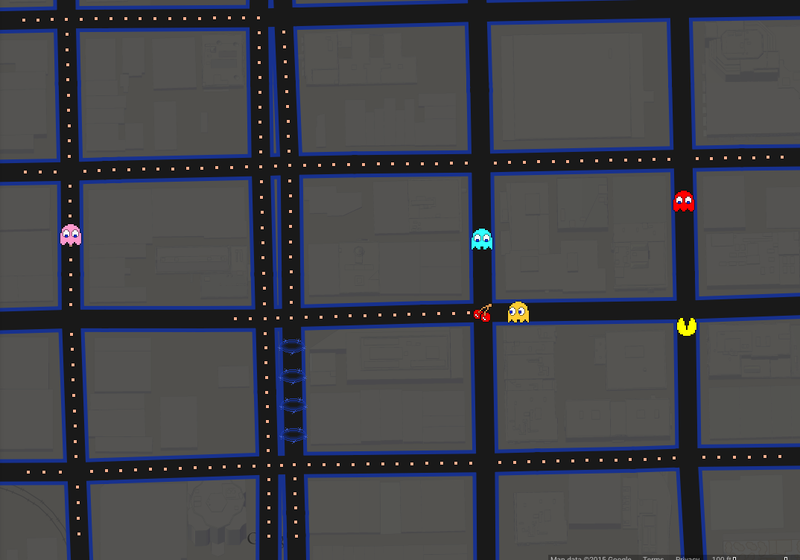 As you may have seen, Google has (OK, I’ll say it — brilliantly) allowed users to turn any city’s street grid in Google Maps into an interactive game of “Pac-Man.” Aside from being the greatest time-waster I’ve ever seen, it also gives the average person a subliminal lesson in urbanism. In a nutshell, we learn the importance of connectivity. 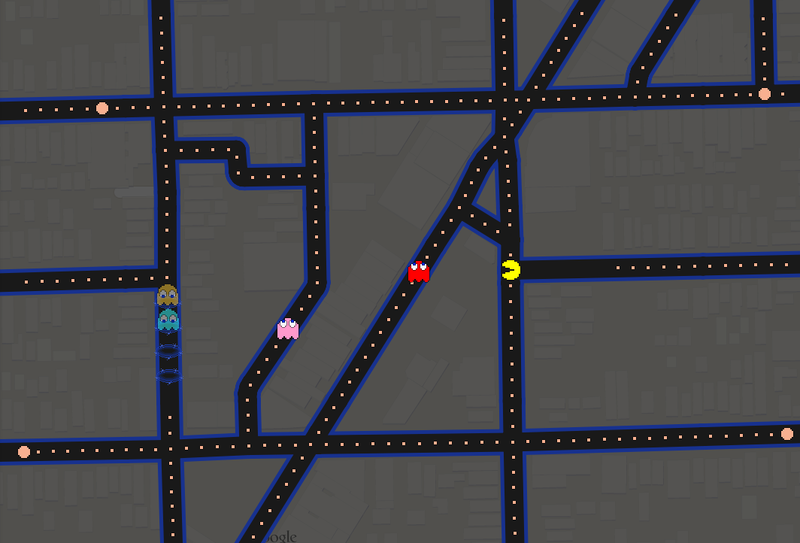 The street network plays a significant role in how we interact with a place, and as Pac-Man learns while trying to avoid (or eat) his ghostly nemeses, a highly-connected network is best. Let’s start in downtown Chicago. I picked River North, a place with small, interconnected blocks that is highly walkable. Here’s what it looks like in “Pac-Man” form. Notice that Pac-Man has numerous routes he can choose to escape the ghosts, just as the average pedestrian has numerous route to get from one place to another. Even drivers can likely find a way to avoid gridlock. That’s the beauty of the street grid. It is designed to handle large amounts of traffic, from vehicles to pedestrians to bicyclists, if used properly. Even better, here is the Pilsen neighborhood, which offers even more options due to the diagonal Blue Island Avenue and the numerous alleys. On the other end of the spectrum, let’s look at a major intersection in the exurban village of Homer Glen. This is a place that developed much later than River North and in a completely suburbanized form. There are few connections, and it was created this way on purpose. In the mid-20th century, we became obsessed with separating uses: Housing goes here, shopping goes there, and we assume that everyone will drive everywhere. Here, Google wouldn’t even let me play. Pac-Man would have virtually no routes to escape, just as the driver would have few ways to escape traffic. In an environment like this, you tend to see two things: Gridlock during busy hours and high-speed traffic during off-peak hours, due to the wide open nature of the road. This is not a place where you would walk. Ever. You can see the historic street grid, but you also notice how it has been eroded around 95th Street. We have gradually been disconnecting one of our main arterials, a place historically designed for a mix of pedestrian activity and vehicular traffic, commerce and housing, and begun turning into a completely separate place from the neighborhoods around it. Pac-Man is beginning to see trouble here. Google couldn’t even connect some of the streets to make those areas navigable in the game. When we cut off the heart of our community from the residents, we will see decline. It becomes a space pedestrians avoid, because it is the only place vehicles can go if we don’t allow the surrounding street grid to capture the traffic volume it was designed for. And after a while, who really wants to drive on a street where you have no options for escaping gridlock? If Pac-Man can’t get away, how do you think a human would respond to this environment? The real word is not an 80’s Atari game. 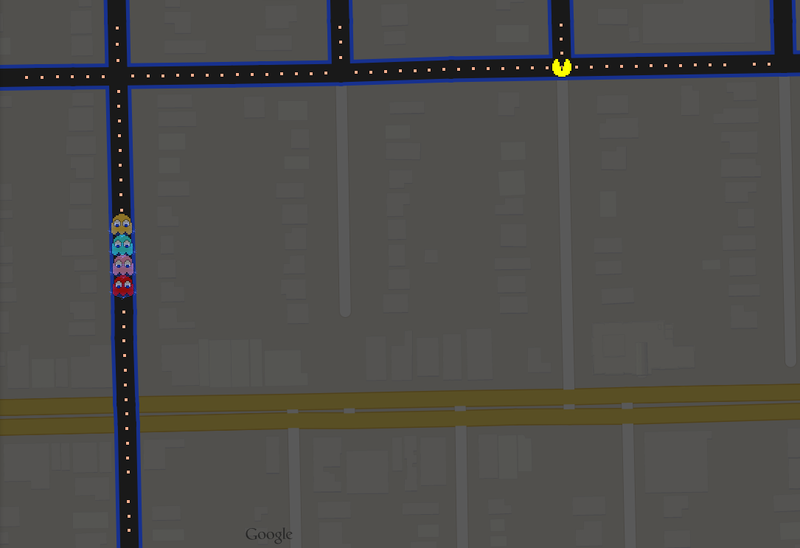 The grid that PacMan uses thinks that 94th and 96th (I’m sure they have names, but they are the E-W streets either side of 95th) are equally valid routes to 95th. They are not. Arterials exist for a reason, some streets carry additional capacity to serve as truck routes, and carry more vehicles efficiently for greater distances. 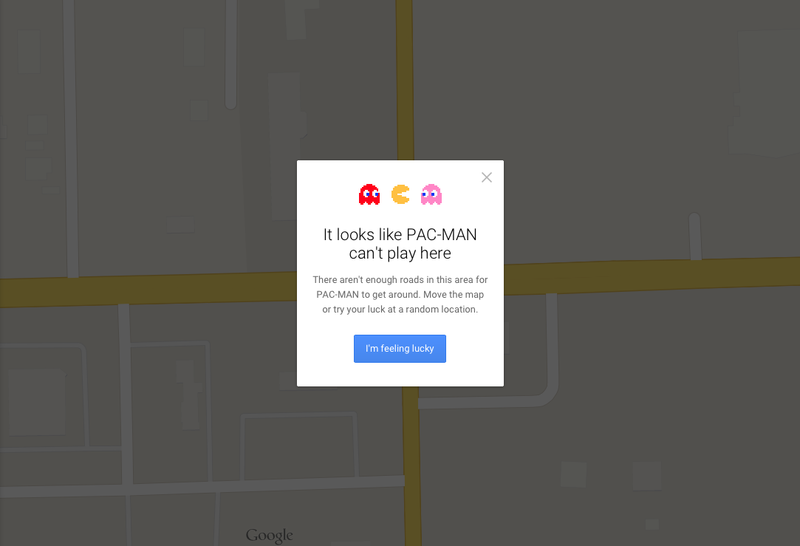 In your scenario, PacMan would die at every single intersection, because all would be signalized, and he would yield to a ghost that would eat him. Game over, *wah, wah, wah. Try again? Thanks for the tip — and for the beer offer! I definitely think some of the changes that will help are going to take time, and that is the tough part. Everybody would love to see change right away, but the changes that will make our neighborhood the strongest don’t happen overnight.